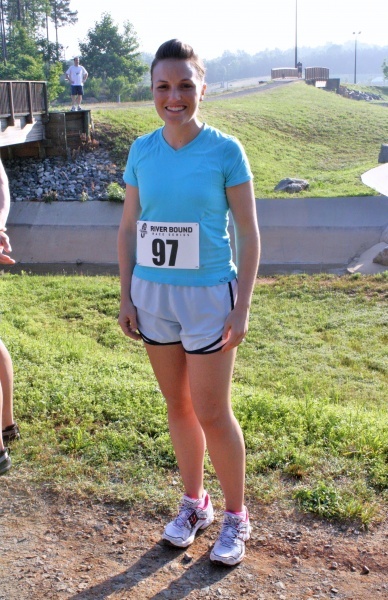 On Saturday morning, I got up at 6 am to run my very first trail race ever. 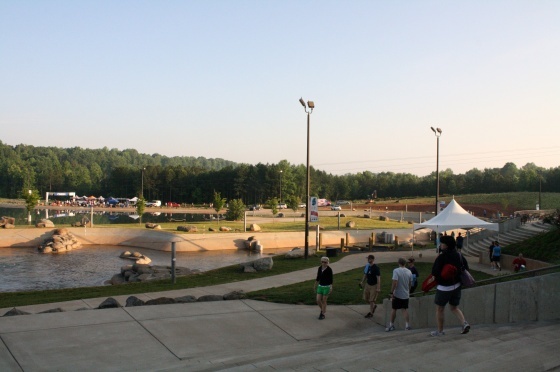 Just last week, on a whim, I decided to sign up for the River Bounce Race Series’ 10K at the National Whitewater Center in Charlotte. The plan was to leave for the race by 6:30 am so I made breakfast for the car: two Van’s whole wheat waffles, TJ’s sunflower butter, homemade blueberry jam, and half a banana. We also stopped by Duncan Doughnuts for coffee to go. 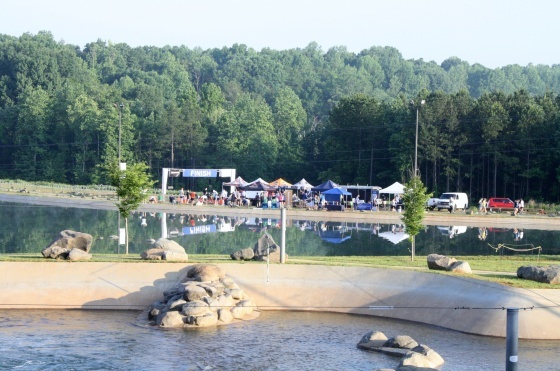 The Whitewater Center is a really cool place for a race. 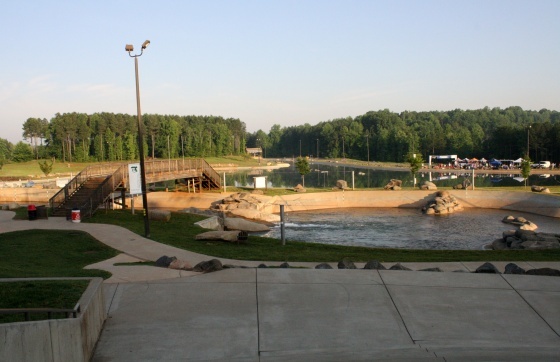 Besides having over 14 miles of trails for mountain biking, hiking, and running, they also have whitewater rafting, kayaking (flatwater and whitewater), stand-up paddle boarding, rock climbing, a zip line, and probably a few other activities I’ve failed to mention. 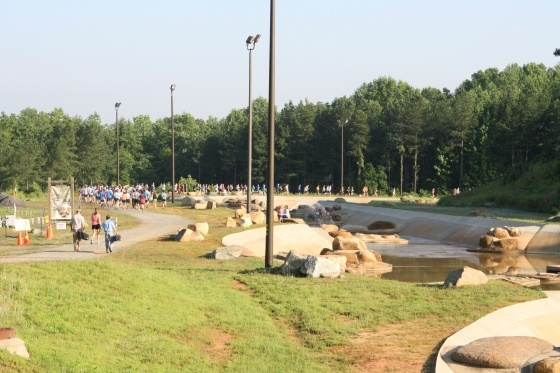 These trail races only have a few hundred participants and since we arrived early, getting my race bib was a piece of cake. 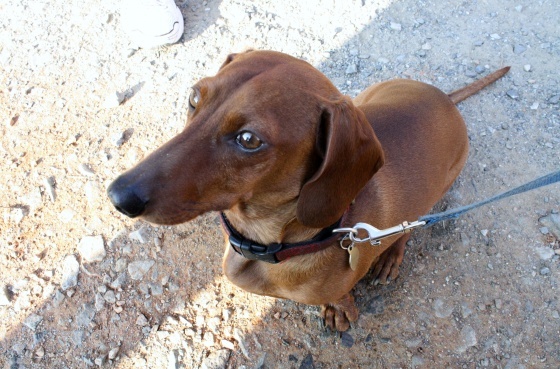 Brad and Rascal came with me to cheer me on so we waited together patiently for the race to begin. We also met up with my friend Michelle, who was also running the race that morning. The weather was absolutely perfect: not too warm and not to humid; sunny and bright. Brad thought it would be fun to take before and after photos of my running shoes since they were brand new and pristine white. We actually never took after photos because they weren’t that impressively dirty. I somehow managed not to get them too terribly dirty by running on the side of the mud pits we came across. This was more for traction’s sake than any effort to keep my shoes clean. I did, however, manage to get quite a bit of mud on my calves. Can you spot me in the lineup? At the last minute they decided to stagger the 5Kers and the 10Kers. There was a lot of mumbling from the 10Kers about whether this was the best strategy. The 5K participants took off about 5 minutes before us. Finally, it was our turn and we took off. The course was difficult. I swear that the second half was a lot more difficult than the first; not because I wasn’t fresh, but because the elevation changes were much more drastic. Here is a trail map with the elevation changes. 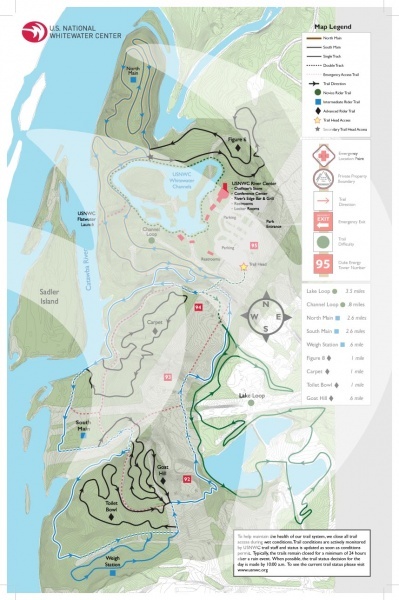 For a larger map of the actual 10K trail, click here. This race was unlike anything I’ve ever done before. The trails were mostly narrow so there were few opportunities for passing. You were basically stuck behind a line of people for the majority of the race. Michelle and I ran with each other the entire time, which I think worked out very well. There were definitely times I would have hung back and not passed the racers in front of us if it wasn’t for her and she said it was the same when I passed. It was extremely important during the race to look at the path at all times so I wouldn’t trip on a root or a rock. There were a few slippery moments, but I didn’t fall once, although I witnessed a few falls. The path was obviously not level and since it rains a good bit in the spring in North Carolina, there were places that water had collected and a few places where it was extremely muddy. I felt increasingly more tired during the second half of the 10K. The elevation changes were significant and there was even one particularly steep incline that I got half way up and decided to walk instead of run. It was really more of a climb than a walk. 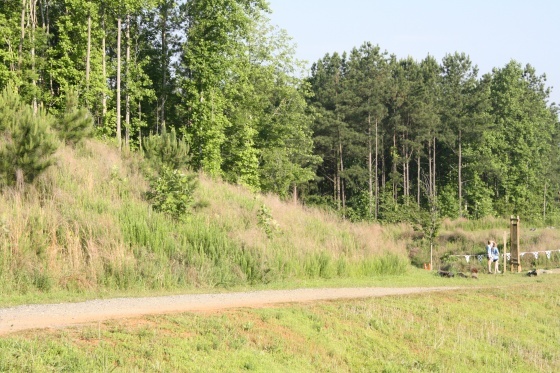 When we finally got to the clearing with 0.3 miles left, I increased my pace thankful to be on the flat terrain and so close to the finish line. When we got a few hundred yards from the finish line, the path became much wider, so Michelle and I finished the race side by side. Your overall finish place 133 and finish percentile is top 62%. Your age group place 11 and your age group percentile is top 52%. Your finish time of 1:01:46 gave you a 9:58 pace per mile. Almost a 10 minute mile is pretty slow for me, for a race. But, as I mentioned before, there wasn’t a lot of opportunity to pass people during this race and coupled with the significant elevation changes, I definitely shouldn’t compare this race with typical 10Ks ran on pavement. Brad said Rascal got bored during the race. My reply was, “Oh yeah, like he has a lot going on at home.” For the most part, I think they had fun spectating at this race. Brad enjoyed watching people cross over the finish line. Since there were two races (the 5K and the 10K), the finishing was spaced out and there was plenty to watch. 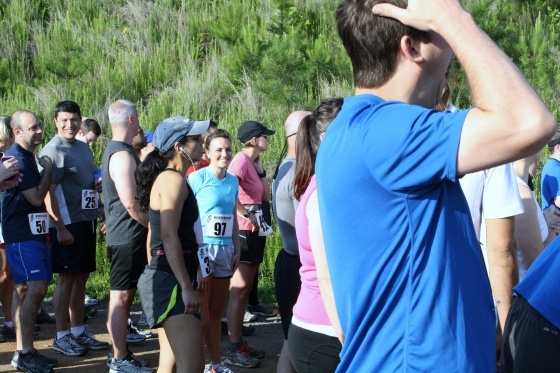 I feel like I learned a lot about trail racing from this experience, but please chime in with a comment if your trail racing experience was different. 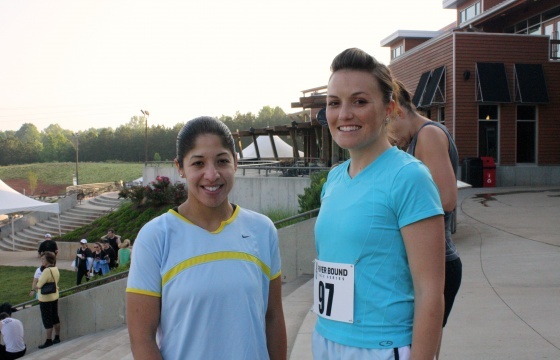 If you are concerned about your time, unlike most races, you should sprint in the beginning. You need to get around as many people as you can, so you’re not stuck behind people much slower than the pace at which you want to run. However, if you’re a novice runner, I wouldn’t push yourself too hard in the beginning, so you don’t expend all your energy or get stuck in a pack of people with which you’re struggling to keep up. I am guilty of running in shoes that have long passed their prime. Although I don’t think trail shoes are a necessity for a trail race, I was lucky that my shoes were new and hadn’t yet started to lose their tread. After all the slipping and sliding I did sprinting down muddy declines, there’s no way I would ever run a trail race with shoes that had partially lost their tread. I like to zone out when I run and when I race. I get settled into my stride and then start to contemplate what to wear tomorrow, my grocery list, my meal planning for the week, and whatever else pops into my mind. 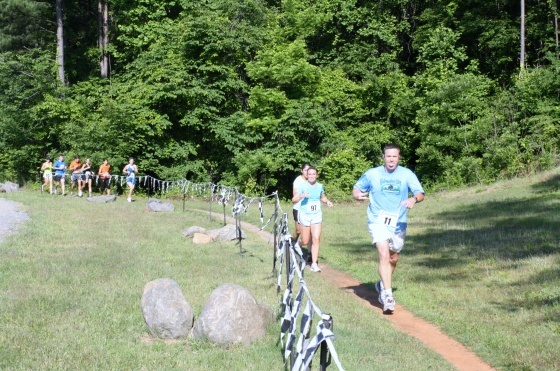 I found that when I did this during my first trail racing experience, I would forget to focus on the trail and my feet. This usually resulted in a stumble or a slip. I had to really keep my focus on what was coming up and how I was going to maneuver over or around it without falling. I would never call myself surefooted so this was especially important for me. My time for this race was much slower than my past 10Ks. 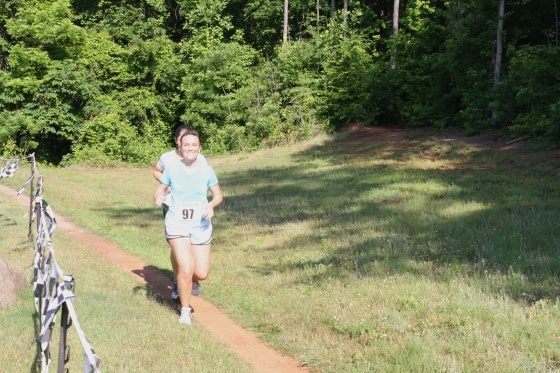 But the way I see it, I shouldn’t compare the trail racing to racing on pavement. It’s like comparing apples to oranges. If I really want to do a comparison to see improvement in speed, I need to run more trail races, preferably on this same trail. It’s difficult to get equal results from dissimilar circumstances. 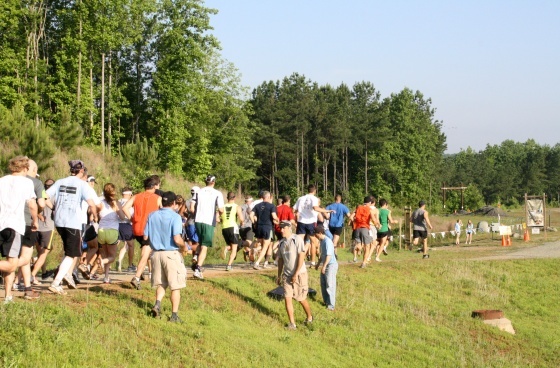 And even though you’ll never race in the same environment twice (even on the same race course on the same date), trail races are so extremely different from regular road races, they deserve their own personal pace. What I mean is, 9:58 is now my current trail race 10K pace time. 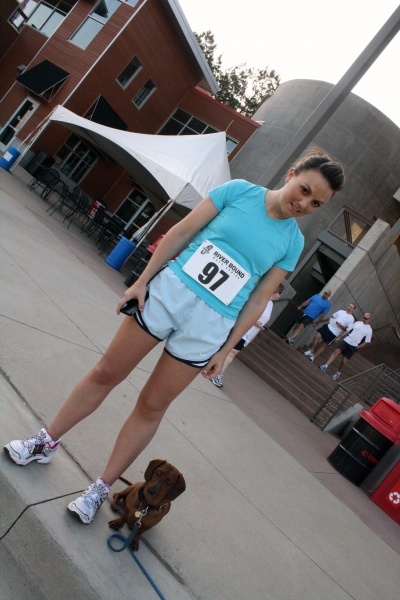 I would like to see improvement from that, but I would never run a 10K road race and then compare the two times. 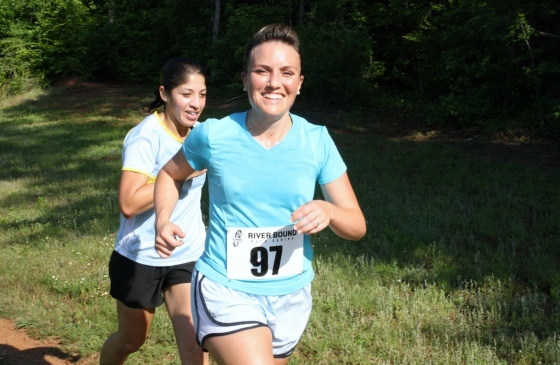 For comparisons sake, I need to run another 10K trail race. Any trail racers out there? 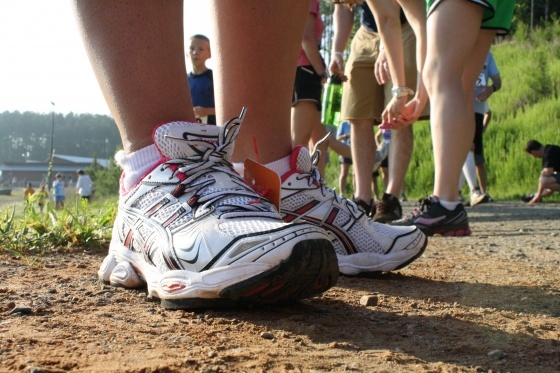 What have you learned from trail racing? Do you agree with my lessons learned or did you have a completely different experience? I was interviewed by Bobby DeMuro last month for the 7-Day Challenge podcast about training for my first marathon. I also discussed the weight gain I experienced during my training. You can listen to it here if you’re interested.